A Life Bound By Books: Celebrating September - Contest #8 Song of the Moon Prize Packs! Celebrating September - Contest #8 Song of the Moon Prize Packs! For this contest there will be TWO winners! 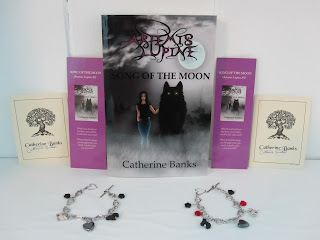 One winner will get a copy of Song of the Moon By: Catherine Banks - it's the first book in the series and you can check out my review here. The winner will also get a signed bookplate, bookmark and one of the bracelets shown here in the picture! The second place winner will get a signed bookplate, bookmark and the other bracelet! So, TWO winners for this one. And here's all the info to get you entered. As always, there's a form. It's easy, and you'll find it a little lower down in this post. Entries in comments will be deleted, and trust me, you'll be thankful for that because it'll help to prevent spam! This contest is open INTERNATIONAL! Also, be sure to check out my Interview with Catherine Banks! Good luck to you all... and thanks so much for entering! I think I might have a few more contests up my sleeve. Yep, I do! YAY, right? More to come, more to come. If you have any questions, please check my policy page or feel free to send me an email. All winners are chosen via Random.org. WhOOoO... Crossing my fingers!=) Thx for the giveaway! !